We’re always on the lookout for higher education marketing campaigns that have that special, indefinable something. You know the type; the ones that make you wish you had thought of them? Well, Georgetown University have inspired such feelings of admiration in us, with their latest ‘Georgetown Stories’ campaign. 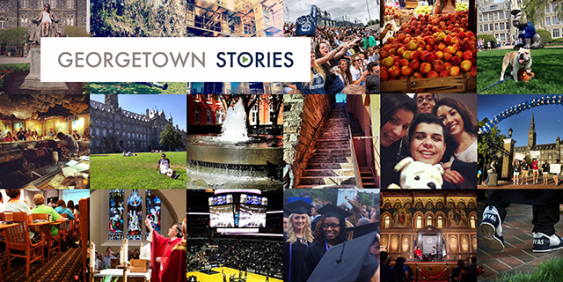 ‘Georgetown Stories’ is a multi-faceted, multi-targeted and multi-media campaign featuring first person video-blogs (vlogs) that follow 11 undergraduate students and their stories throughout their academic year. The goal of Georgetown’s campaign it to create a connection between the university’s community of students, parents, friends and alumni and enable them to share the Georgetown experience in an instantaneous and shared way. ‘Georgetown Stories’ comprises a series of videos; both ‘selfies’ and professionally taken, alongside photographs, email and social media in a bid to best capture what a year in the life of their students is really like. Classes, events, parties, travel, study and everyday life are just some of the topics covered by the students in their vlogs. Other students and members of the alumni community are encouraged to share their experiences of Georgetown University by using the hashtag #Georgetownstories to post photos, videos and stories to social media throughout the academic year. The Georgetown Stories campaign shows just how important it is for universities and colleges to involve students in the creation of their marketing campaigns. It also serves as a pretty perfect example of what great, student-centric and student managed video content can do when it comes to promoting a university to prospective students and alumni members. We could talk all day about how much we love this campaign but we're sure you get the idea. Visit the Georgetown Stories homepage, watch some of the great student videos and see for yourself what all the very worthy fuss is about!